Apollo (Carl Weathers) is tough on an exhausted Rocky (Sylvester Stallone) during a training session before his fight against Clubber. Sylvester Stallone returns to the character which made him famous in this wildly successful sequel. Rocky III starts with the Italian Stallion so famous that his likeness is everywhere, including pinball machines. Fame and complacency soon cause Balboa to lose his title to young thug Clubber Lang (Mr. T), who inadvertently causes the death of Rocky's beloved trainer, Mickey (Burgess Meredith), before their first championship bout. 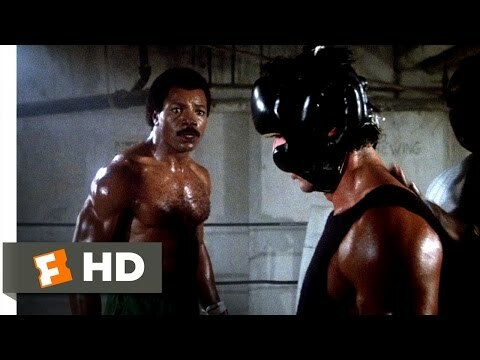 After sinking into a depression, Balboa must regain the love and support of his family, as well as the elusive "eye of the tiger," the hungry need to beat the opponent which former foe Apollo Creed (Carl Weathers) teaches him during this film's de rigueur training sequence. In the end, Balboa faces off against Lang for a second time. "Eye of the Tiger," the theme song Stallone commissioned from the band Survivor, became a huge hit single.